However, it was not considered practical at that time to develop such a vehicle with the limited funds available. The second approach was to use the new M2 infantry fighting vehicle for this role. This was not feasible because of its limited troop capacity and its inability to operate in surf. The third alternative, referred to as the LVT(X), was then the preferred solution. It was to be a displacement hull amphibian vehicle water speeds exceeding 10 miles per hour and was expected to provide improvements in firepower, survivability, and mobility compared to the LVTP7 family at an affordable price. 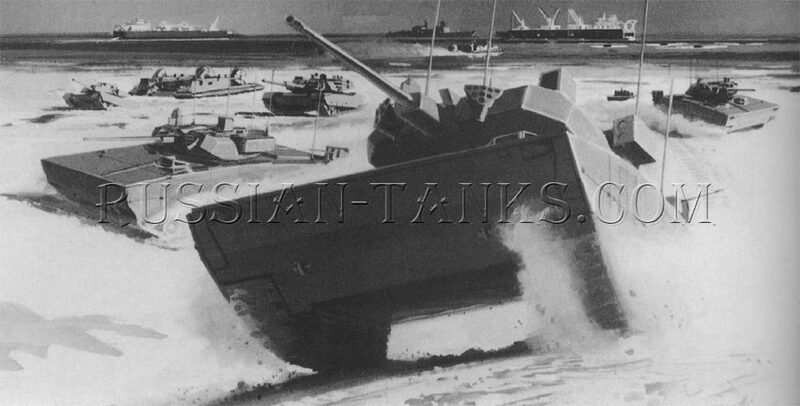 The LVT(X) was to be the basis of a family of amphibious vehicles that could operate on land as an infantry fighting vehicle and survive in an NBC environment. Although the original LVA program was terminated, one part of it remained. This was the development of the stratified charge rotary combustion (SCRC) engine. The SCRC was a four rotor 1,500 horsepower engine. The engine program was continued because of its possible application to other vehicles. It was expected to provide a lighter, more compact, power plant than the diesel engine for equivalent horsepower and it would be quieter and have a multi-fuel capability. A number of concepts were studied for application to the LVT(X) requirement. FMC also proposed a vehicle based upon components of the M113A2 armored personnel carrier. It was intended to carry a squad size unit from ship to shore and on to the final objective. 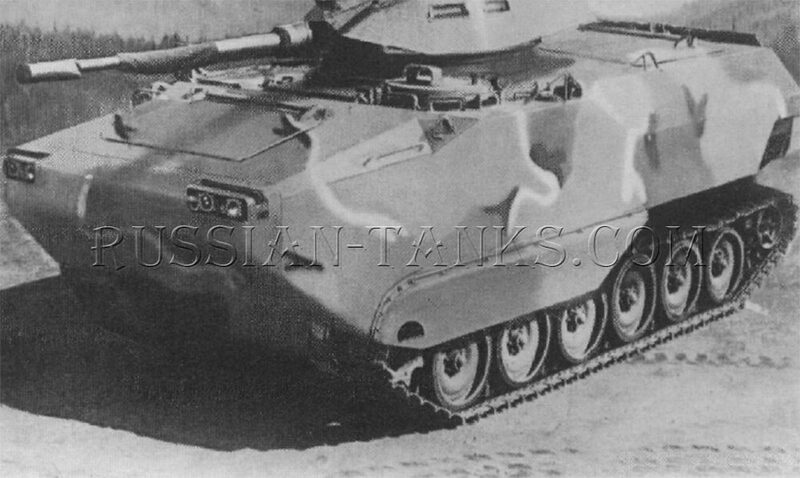 Although it was small and did not meet the 10 miles per hour water speed requirement of the LVT(X), it could be armed with a variety of weapons and serve both as an assault landing vehicle and as a land fighting vehicle. 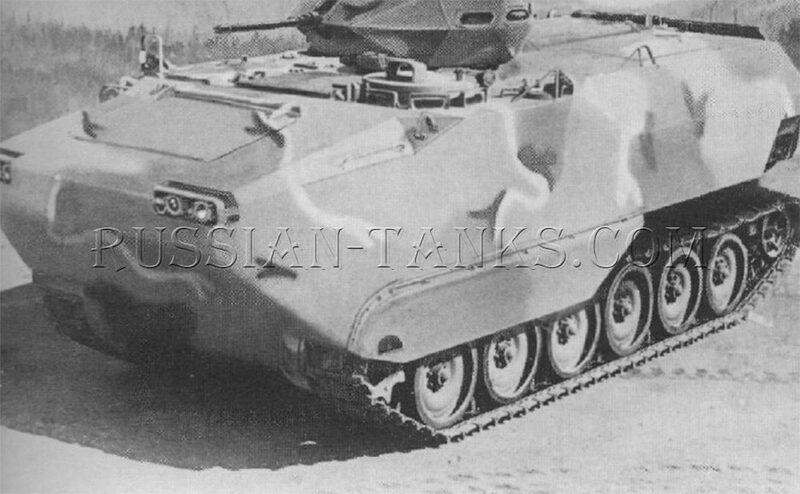 Dubbed the LVT assault personnel carrier, it was intended to serve as the basis of a family of vehicles. Assembled from aluminum alloy armor plate, the proposed LVT assault personnel carrier was to be manned by a crew of two and carry a 13 man squad in the rear compartment. The hydraulically operated rear ramp had a door for personnel and a cargo hatch was located over the rear compartment. The driver was in the left front and the vehicle commander was in the cupola. The latter could be anything from the M113A1 type cupola with an externally mounted .50 caliber machine gun to a one man weapon station armed with a .50 caliber machine gun or a 25mm Bushmaster cannon. The vehicle was to be powered by the 300 horsepower 6V53T diesel engine using the Allison TX100-1A transmission with a hydrostatic steering differential. The M113A2 suspension was used on the lengthened vehicle with six road wheels per side. It rode on 17 inch wide tracks. When afloat, the vehicle was propelled by two water-jets powered by two fixed displacement hydraulic motors driven by the hydrostatic steering pump. This arrangement eliminated the need for drive shafts and gear boxes in the crew compartment. The tracks and water-jets could be operated simultaneously. Combat loaded, the estimated weight was about 33,000 pounds including a 5,000 payload. The maximum speed was expected to be 38 miles per hour on land and 7 miles per hour in water with a cruising range on roads of about 300 miles. A larger, two man, turret also was proposed for installation on the hull of the LVT assault personnel carrier. Armed with a 90mm Cockerill cannon and a coaxial 7.62mm machine gun, the turret also had an external mount for an additional 7.62mm machine gun at the commander's hatch. Eight 90mm ready rounds were stowed in the turret with an additional 32 rounds in the hull. The crew now consisted of the driver in the left front hull with the commander and the loader in the turret. Six squad members also could be accommodated in the rear compartment. By the late 1980s, U.S. Marine Corps doctrine envisioned over-the-horizon (OTH) landings for future amphibious assaults. The OTH concept allowed the transport vessels to remain 20 to 25 miles at sea reducing theirvulnerability to shore based weapons. However, this doctrine immediately reinstated the high water speed requirement for the landing vehicles. The combination of a high water speed and the capability to operate as a fighting vehicle ashore presented a difficult design problem. A request for information was issued to industry in September 1988 followed in the Spring of 1989 by a formal request for proposals. After the review of a large number of proposals, General Dynamics Land System (GDLS) Division and the Ground Systems Division ofFMC were awarded development contracts for a new advanced assault amphibian vehicle (AAAV). The new AAAV was to be manned by a crew of three consisting of the driver, assistant driver, and the commander/gunner. It would be able to transport a reinforced Marine rifle squad of 18 men. The length and width of the vehicle could not exceed 30 and 12 feet respectively. It would have a maximum water speed of 25 to 30 miles per hour and a range of 75 miles. The maximum speed would have to be maintained in Sea State 3 conditions and the vehicle would have to survive Sea State 5 conditions including the ability to right itself after a 100 degree roll. Like the LVTP7, the AAAV would have to operate in a 10 foot plunging surf. On land, the AAAV was required to have mobility comparable to the Abrams main battle tank and its armor would have to withstand attack from 14.5mm projectiles and protection against 30mm projectiles was desired. The turret mounted main armament was to be 25mm, 30mm, or 35mm in caliber firing conventional ammunition. Initially, the contractors followed two different approaches. GDLS working with AAI Corporation considered a planing hull to obtain the necessary water speed. Several test rigs were constructed including a high water speed technology demonstrator (HWSTD) and a propulsion system demonstrator (PSD). The HWSTD reached 29 miles per hour in some of its tests. FMC proposed a hydrofoil assisted planing hull to achieve the high speed. Early tests with a half size model had reached 37 miles per hour. This approach required the use of hydrofoils that could be extended into the water when the vehicle was underway and then retracted for land operations. The planing hull approach also was complicated, requiring the extension of a folding bow assembly and the retraction of the running gear against the hull. After further tests, the Marine Corps indicated a preference for the planing hull approach and the FMC candidate also utilized that design.